GGH (Gamma glutamyl hydrolase), also named as GH or Conjugase, is a key lysosomal enzyme involved in the metabolism of folic acid and in the action of antifolate drugs (PMID: 16945597). GGH catalyzes the removal of γ-linked polyglutamates from the intracellular folylpolyglutamates to yield folylmonoglutamate coenzymes (PMID: 9614206). The full-length protein has a calculated molecular mass of 36 kDa, contains four potential asparagine glycosylation sites, and was predicted to have a 24-amino-acid signal peptide (PMID: 8816764). GGH can form homodimer which contains two potential active sites (PMID: 16945597). 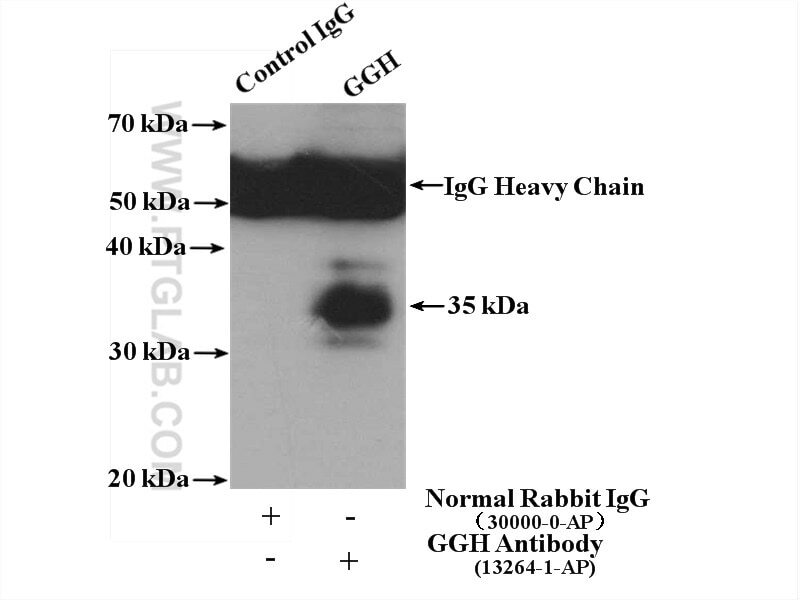 Some bands can be detected by SDS-PAGE: 35-37kDa (full-length), 55kDa (glycosylated form) and 30-33kDa (signal peptide removed) (PMID: 8621474).